Over the last few weeks, I have run into some really cool resources online to help me out. Even though I have been an electronics tech for 23 years, 9 in the US Navy and 14 in the telecom world, there is no reason to figure it out on your own when you have great resources at your fingertips! When I rebuilt my Kayfun clone last night to .8 ohms, I thought that I should share some of the links. 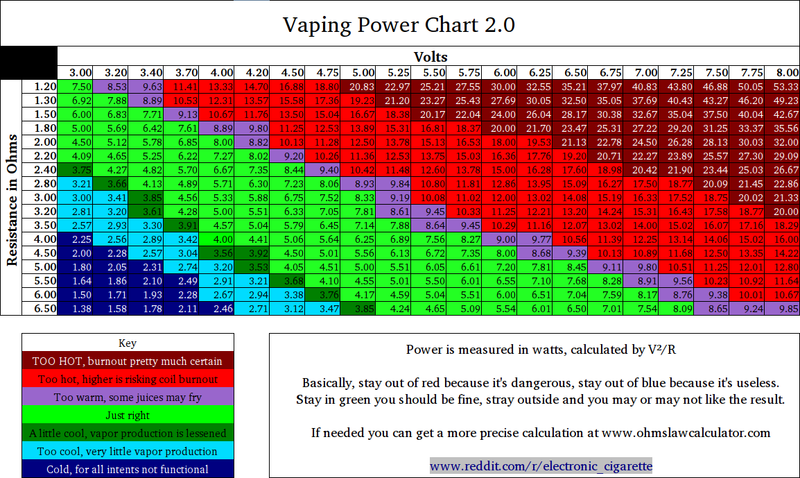 Vaping Power Chart – I found this one in a Google Search and uploaded it here to preserve. Steam Engine – This site is an all-in-one resource for vapers. It has an Ohm’s law calculator, coil wrapping calculator, battery drain calculator, and a DIY e-liquid calculator. Coil Toy – a nifty coil calculator. I will add to this list as I find others! I have ordered my 1st Authentic Mech Mod!